Anyone who knows me or who has seen me dressed for the chillier months, knows that I LOVE faux fur. I have several faux fur vests and coats. I plan on upholstering a small stool in my sister’s bedroom with some faux fur because she is in desperate need of a foo foo bench. Who isn’t, really? I recently purchased a faux fur pillow to be featured on the formal living room sofa. Our bond is so deep that I named her Priscilla the Pet Pillow. I’m also a fan of alliteration. Maybe I’ll write a book about her one day like those dogs that live at hotels. Priscilla the Pet Pillow Goes to Paris. I like it. File that one for retirement. While there are only so many appropriate applications for faux fur as it doesn’t lend itself to bathing suits, table cloths, or car exteriors, I was ecstatic/overjoyed/borderline mental when I came across Restoration Hardware’s new line of faux fur accents in their catalog. More specifically, their faux fur wine holders. I literally jumped in the car and drove to the mall. 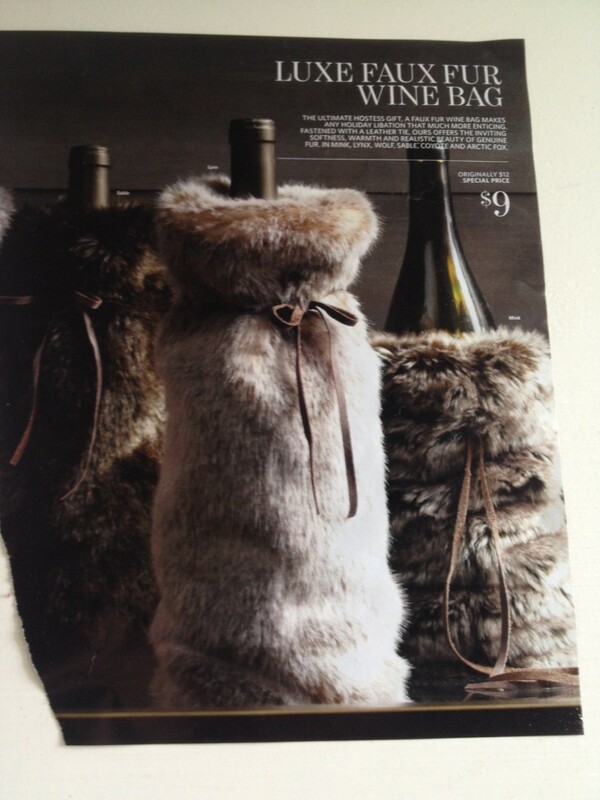 In less than 30 minutes, I was walking out of Restoration Hardware with my bag fabulous faux fur wine holders in tow. P.S. There is a faux fur laptop case. I need it. In Mink. Does Santa read blogs? Though I am five at heart, I’m apparently forty to fifty on the head. Not in the head, but on the head. I’ve had the good fortune of gray hair since high school. I take this as a sign that I’m wise beyond my years because I am trying to find anything positive about this situation. 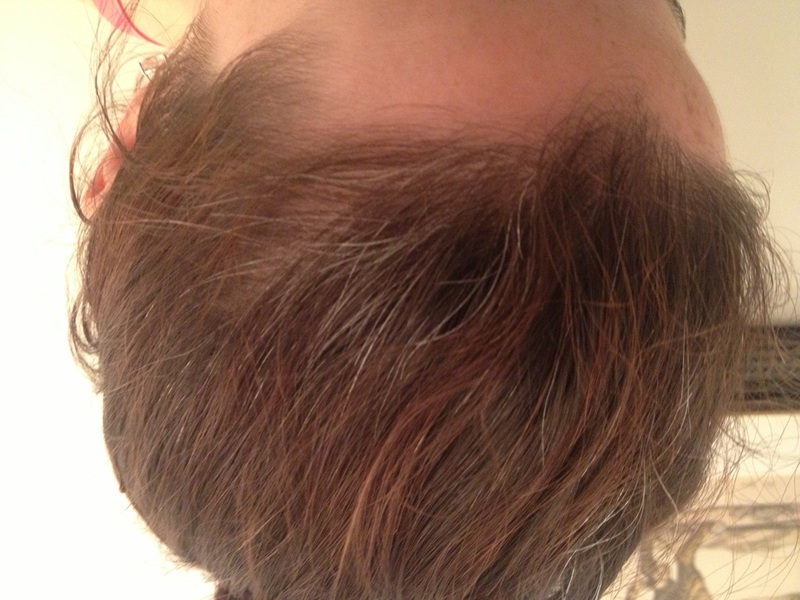 As some of you wise-haired people know, these gray hair situations are pricey to conceal. I usually leave the hair dying to professionals but that has gotten expensive and necessary more frequently than I’d like and my friend Jessica assured me it was a cinch to do at home. 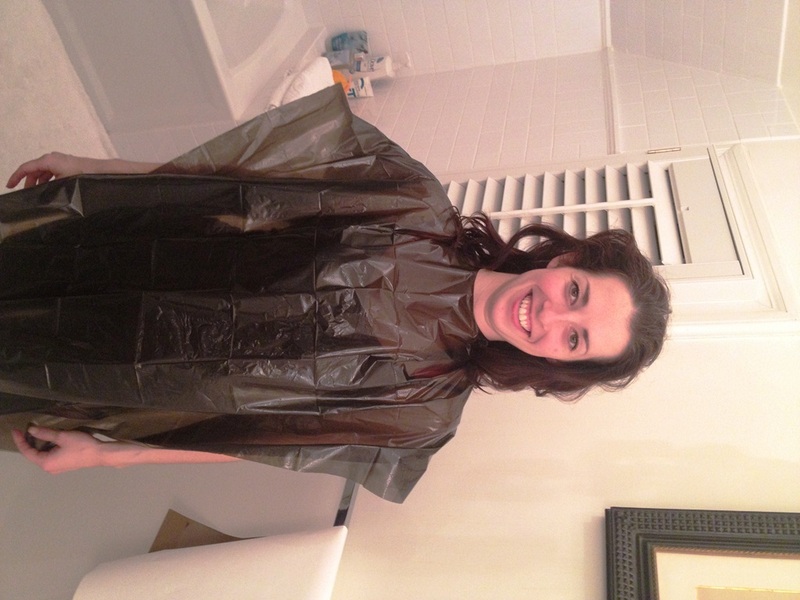 I decided to take the plunge and let her help me dye my hair. And by help me, I mean do it for me in exchange for dinner. I was on my own, however, for the trip to Sally’s beauty supply. My natural hair color is a very dark brown, even though my granny calls me her “black-headed” child. I typically like to dye my hair (have my hair dyed by a professional) a tad darker and throw in some violet undertones. It really brings out the green in my eyes and the ghost-like quality of my skin. 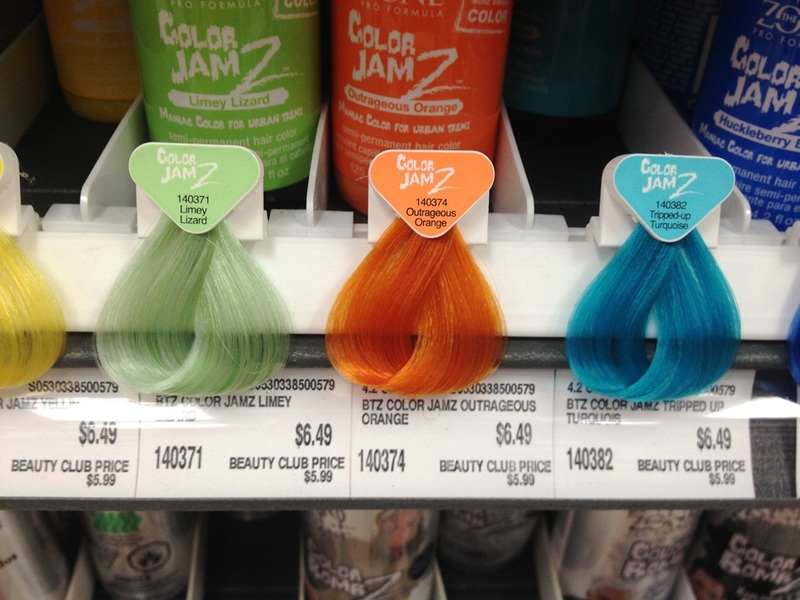 I was intrigued by this set of colors. They might make me look more tan than the violet, but that’s probably about all they would do for me. I headed home with my youth in a box as well as a handy little kit of supplies and Jessica got to work mixing up the pigment with the stuff that makes it stick to your hair. Binder? Extender? Developer? Tar? Something like that. Excellent. I decided to focus on prepping myself for my transformation instead of the helpful commentary. Having donned my high-end “cape,” I was feeling a little warm. 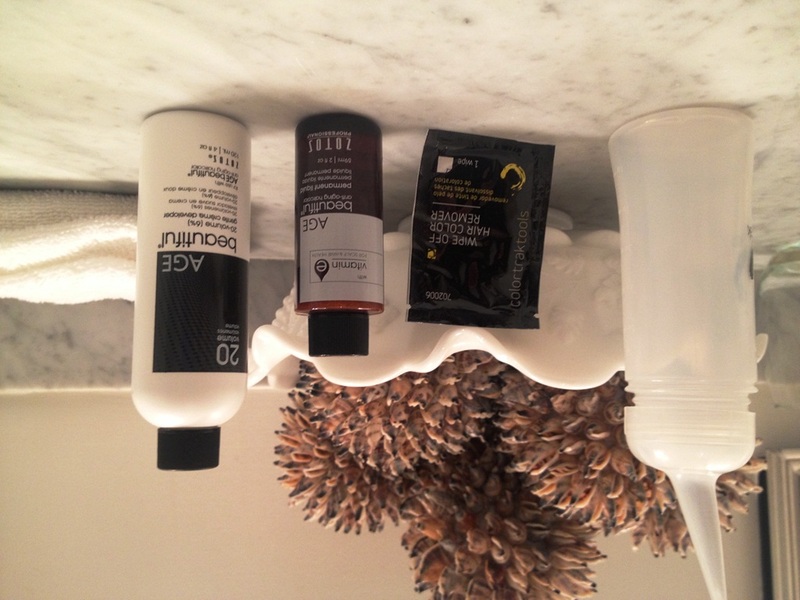 The whole point of this DIY hair color is to save money. Maybe next time I’ll roll the $2.99 into my 401K and just use a lawn-size trash bag. I sat on the toilet and Jessica got to work processing my hair. Though my bathroom is fairly generous in size, the fumes from the hair dye were so strong that it might serve as an alternative to general anesthesia. 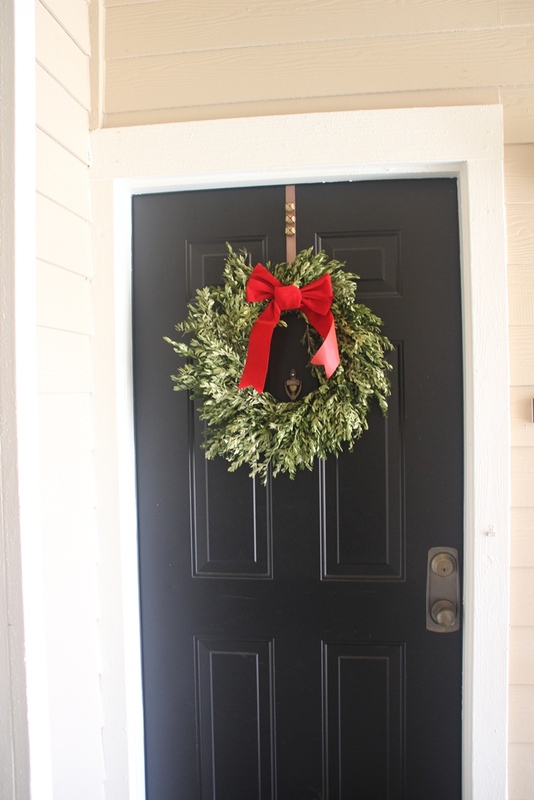 Even with the fan on and the door open, Jessica and I barely maintained consciousness throughout the process. I highly recommend this thoroughly enjoyable experience. We let my hair “process” on my head for a while and then it was time for the moment of truth after I washed the color out of my hair. If you’ve ever washed violet hair dye out of your hair in a white shower and watched the show Dexter, this might be a very disturbing experience as you might think you’ve been shot. 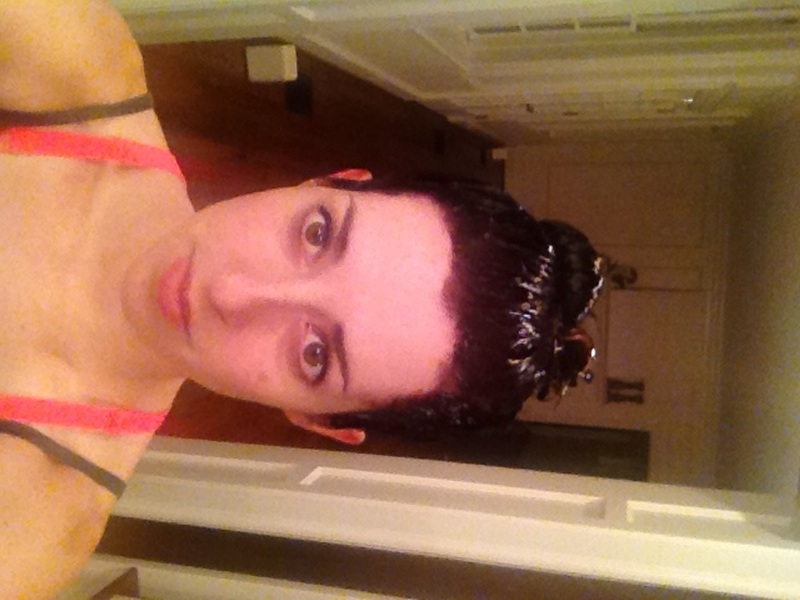 And having just awoken from my hair-dye-induced coma that is a highly plausible situation for all you know. I made it out alive and my hair color looked pretty good. 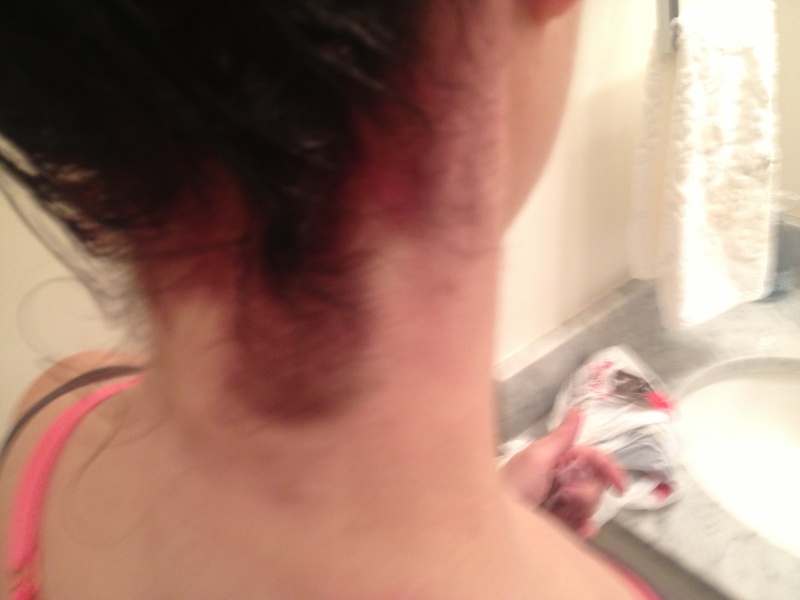 Jessica will remain in good standing; however, I don’t think I can go through that experience every 4-6 weeks. Maybe I should go blonde. I recently purchased Gwyneth Paltrow’s new book, “It’s All Good,” intrigued by the idea of healthier and cleaner eating. The book offers a lot of great information and recipes about eating diary-free and gluten-free. It also discusses healthier choices for fats and non-meat proteins. As someone with a sensitive stomach, I thought I might try out some of these ideas with my meals. Don’t get me wrong though, you won’t catch me eating tofu lettuce wraps any time soon/ever. Except that one time I made them for dinner at my parents’ house. I tried hard to sell them to my dad as a delightfully healthy alternative to beef tacos and he just wasn’t buying it. And neither was I. So I decided to apply my new way of thinking about eating to a fairly familiar food: pizza. I headed to Dominos one evening a few weeks back. I went in and ordered a medium gluten-free pizza thinking that was the smallest size. Verdict: The pizza was pretty terrible and expensive. I think I’ll stick to the real stuff and just eat it infrequently. My next venture was speckled lima beans. I must admit that I usually make these with bacon grease and on this occasion I fully intended to make them that way; however, there was no bacon or bacon grease to be found in my refrigerator. 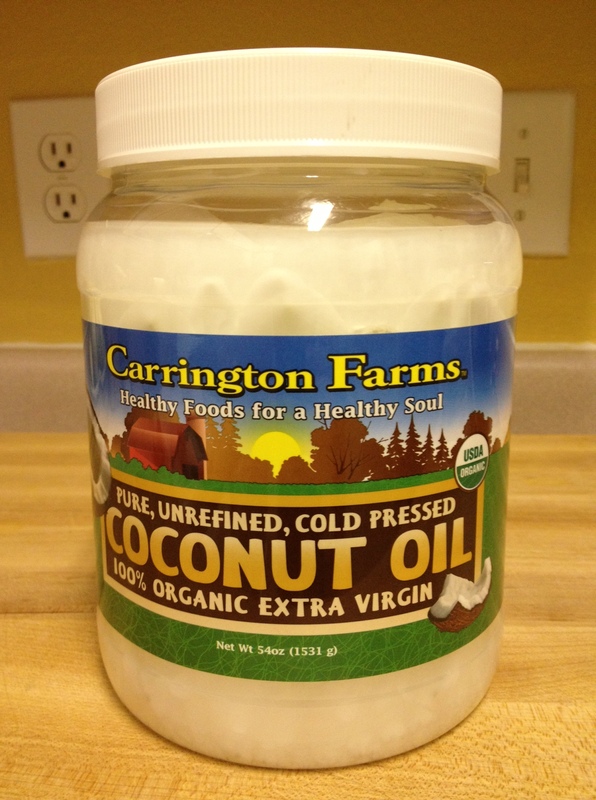 Having carefully studied all of the critical pantry items for a dairy-free and gluten-free household, I had thought it was worthwhile to purchase a TUB of coconut oil at the wholesale club. Never mind that I only cook a few nights per week, I hate coconut, and I am the only one in the household that will be using the coconut oil. The 54oz tub was just the ticket. Seeing the tub of coconut oil sitting on the counter, I decided to throw a few healthy spoonfuls in as my fat for the beans. Boy was that a misstep. I thought it would be a subtle taste, but no. I threw in a halved onion and 2 cloves of garlic to try to mitigate the undesirable coconut flavor. It helped, but the coconut was still there in a big bad way. Bacon grease and coconut oil are not similar flavor profiles in case you were wondering. Verdict: Good thing you can use this stuff as moisturizer. I’ll be smelling pretty tropical for the next 23.4 years or however long it takes me to saturate my skin with that tub of coconut oil. Having failed miserably with savory options, I thought I might have better luck with something sweet. 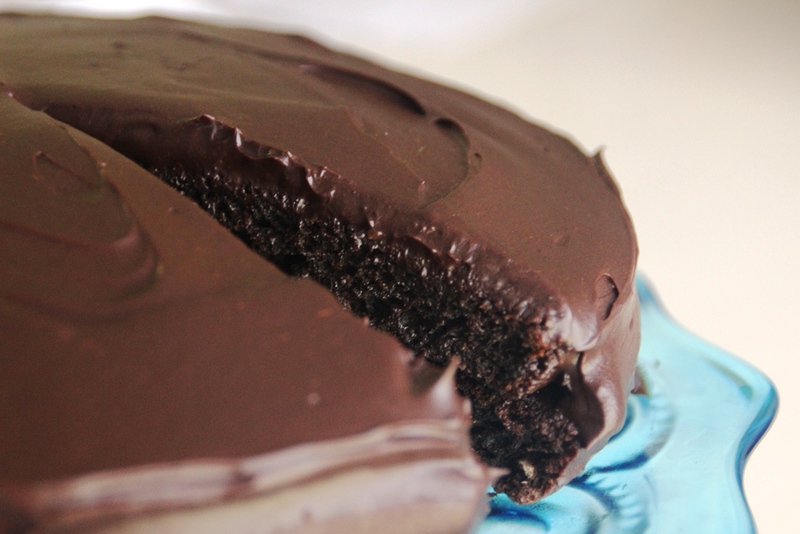 I found this recipe that sounded great for a gluten-free fudgy chocolate cake. How bad could that be? It looked so pretty, but underneath that icing lay a very strange tangy, cleaning solution-like aftertaste and a chewy texture much like an actual dish sponge (not to be confused with the lovely texture of sponge-cake). It nearly ruined chocolate cake for me. In an effort to stay positive and salvage the situation, I have been scraping off the naturally gluten-free chocolate icing and eating it by the spoonful. I now have a scalped cake in my refrigerator. Verdict: There’s a reason people bake with wheat flour. While I started this blog mainly to capture moments of my life that I never want to forget, it has proven to be so much more. It eased me through the transition to my new home. It has kept me connected to my family and friends who regularly read the Sugarlump and comment. In turn, it assures them that I am alive and well. Some of my extended family members and family friends have probably learned more about me through reading my blog this past year than they had learned about me in all the years they’ve known me combined. Whether that’s good or bad, I don’t know. I’m just putting it all out there. Most surprisingly, The Sugarlump has connected me to new friends who I know only because they have found my blog or I have found theirs. Who knew complete strangers would take the time to leave a kind note or helpful tips? This blog regularly reassures me that this world is indeed full of good people. This blog has given me the motivation to learn more about photography as it provides a great outlet through which to share the thousands of photographs I have taken since moving to Nashville. I apologize to my readers who don’t care for cats or weather reporting. I hope to get out more this summer. Though I am generally journaling-averse, writing posts has been a kind of therapy for me. It helps me to find joy in the little things as I reflect on my day. It puts things into perspective. It keeps me connected in a more meaningful way. I never would have thought I’d call myself a blogger, but a blogger I have become. And even though I have slacked off on the blogging as my life has become busier in Nashville, I hope to continue celebrating blog anniversaries. Thanks to my faithful readers for all of your “likes” and comments. You make my day. I once had a peanut butter chocolate chip cookie at a local restaurant in the town I grew up in. 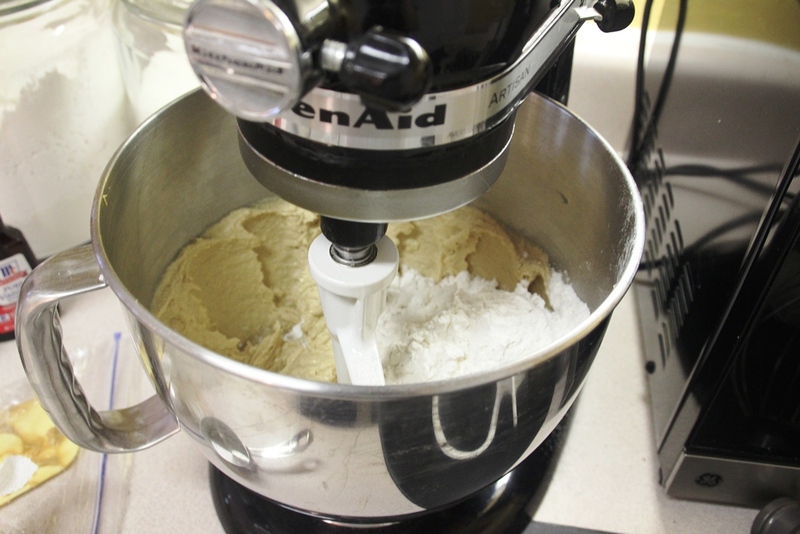 After that day, it became my mission to perfect a peanut butter chocolate chip cookie recipe. It took many a flop for me to get to where I am today. I tried several recipes I found online and none was peanut-buttery enough. So I tinkered with this and that and I think I’ve got a good thing going. The trick is to put in A LOT of peanut butter. Shocking, I know. Also, take the cookies out of the oven before they look done. I mean it. If you leave them in there until they look done, they will turn into bricks. And no one likes to eat peanut butter chocolate chip bricks. If you want to become instantly popular among your younger sister’s high school pals, I would suggest making these cookies. After I made the cookies for the youngsters the first time, I was hit up for a double batch almost every time they came over. I nearly broke my mixer once when I received a triple batch request. There were never any cookies left by the time Eugene’s friends went home. 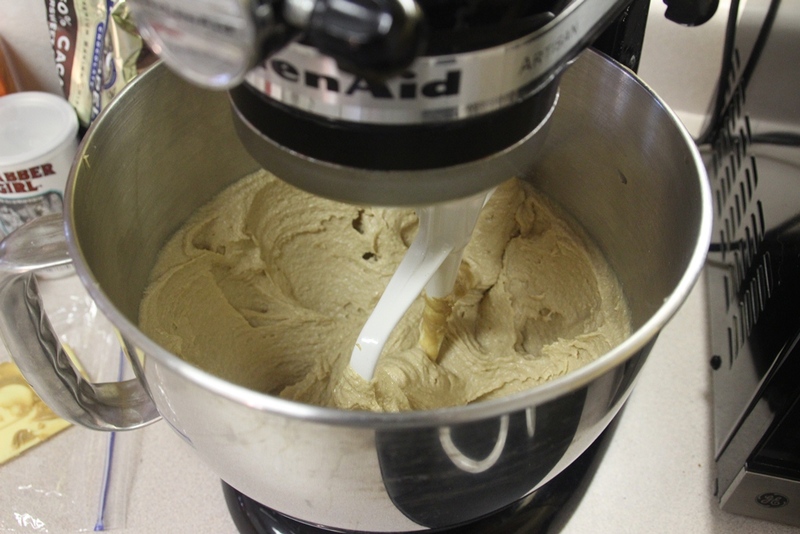 Assemble butter, peanut butter, sugar, light brown sugar, eggs, all-purpose flour, baking soda, baking powder, salt, and chocolate chips but NOT vanilla extract. I don’t know what that was doing there. 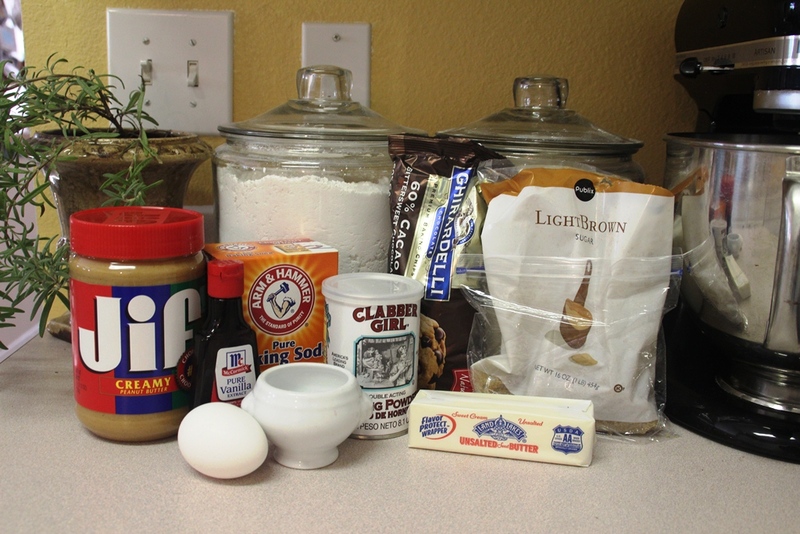 Measure out the first 4 ingredients and throw them into a mixing bowl. I would highly recommend spraying your measuring cup with cooking spray to help that peanut butter slide right into the bowl. 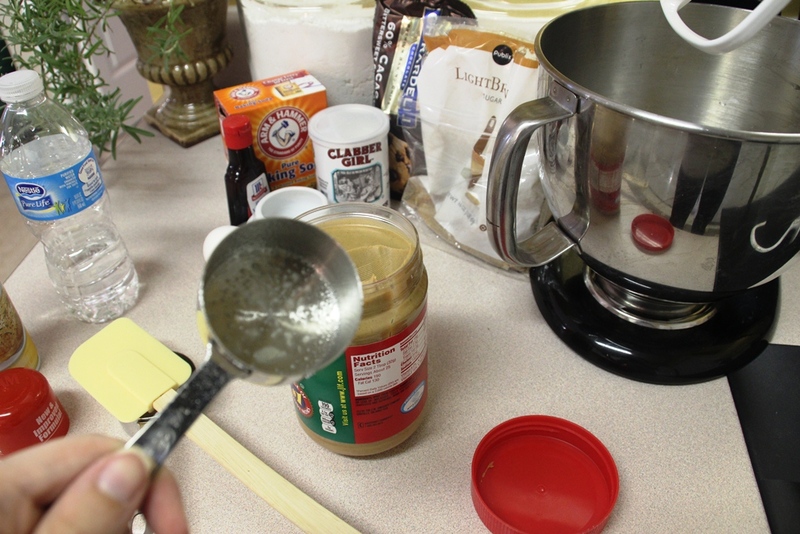 Keep a spatula handy in case the peanut butter gets pesky. 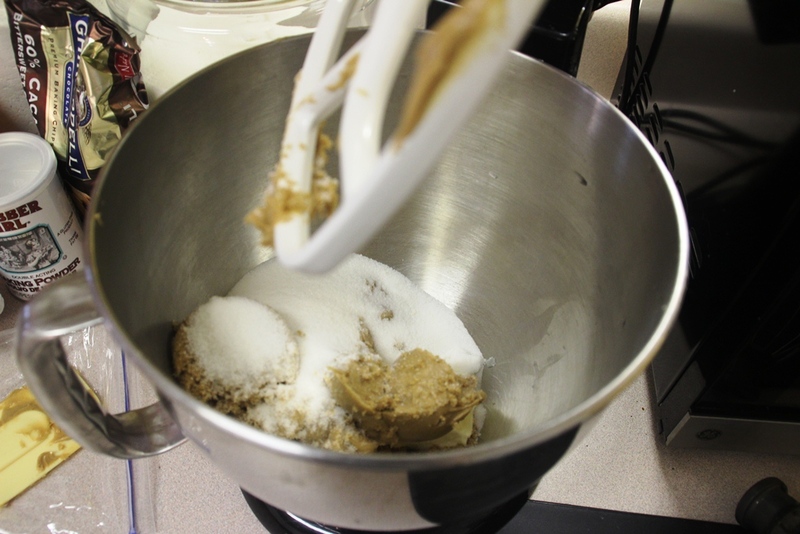 Cream the butter, peanut butter and white and brown sugars until light in color. Add the egg and mix until incorporated. Sift together flour, baking powder, baking soda and salt. Add dry mixture to wet mixture and mix until just combined. Stir in chocolate chips by hand. I would have taken a picture but I was stirring. 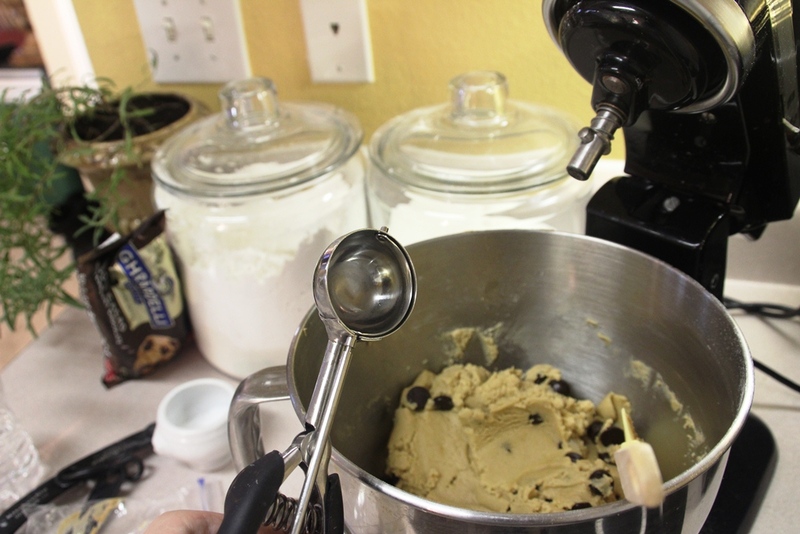 Drop the dough onto a baking sheet using a large spring-loaded cookie/ice-cream scoop for even cookies. Press down to flatten the cookies to ¾” thick. The cookies should be about 3″ in diameter. 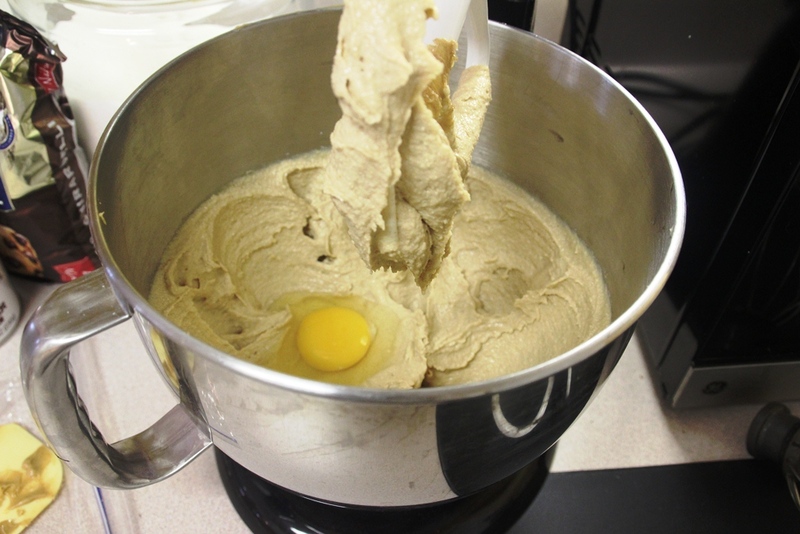 If you only have a medium size cookie/ice-cream scoop like the one pictured above, your cookies will be about 2″ in diameter. Press any straggler dough into the sides of the cookies so they look prettier and more uniform when they come out of the oven. Bake for 8-12 minutes (depending on your scoop size) or until just barely starting to brown. The cookies will look underdone. 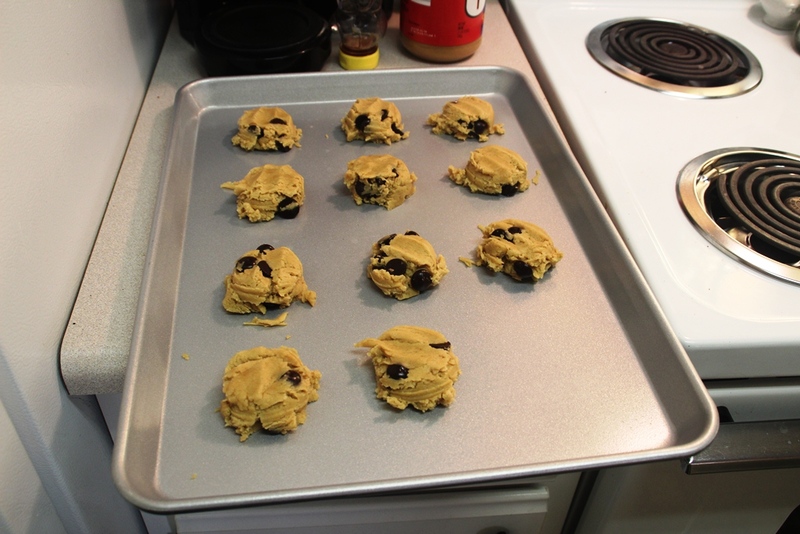 Let the cookies cool for 5 minutes on baking sheet and then serve or finish cooling them on wire rack. I tidied up the edges of the dough for the cookies on the left and neglected to do so for the batch on the right. The ones on the left are much more attractive. 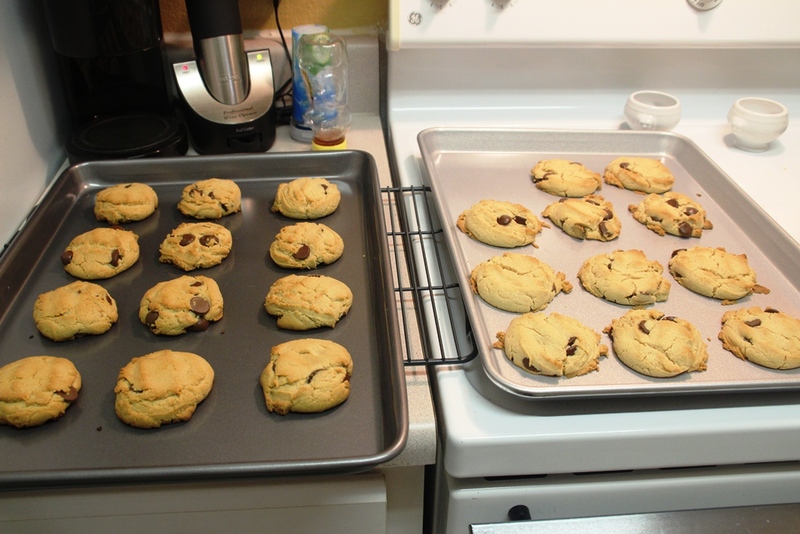 However, I over-baked the cookies on the left and the ones on the right were just right. You really have the watch these suckers. 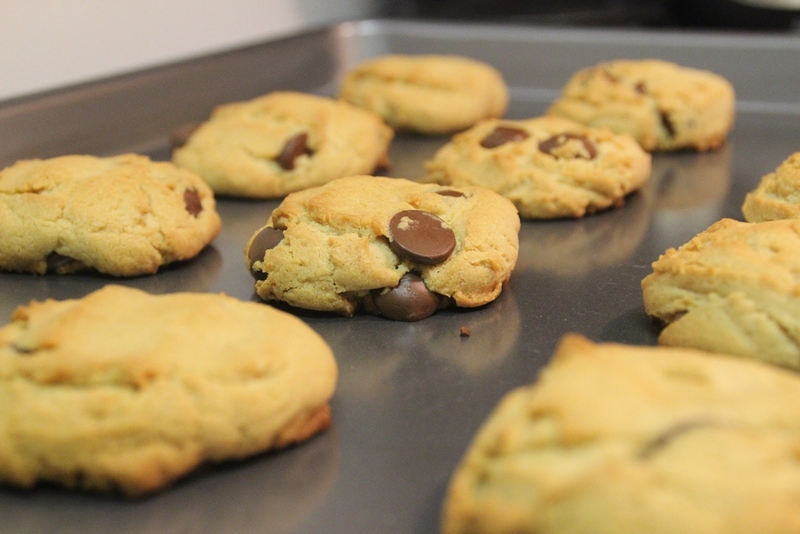 The MOMENT you see just a hint of brown on the cookies, remove them from the oven to cool IMMEDIATELY. I’m new to the iphone 4. I realize that the iphone 5 just came out, but I likely won’t be ready for that kind of innovation until 2015. It’s not that I’m opposed to technology; I’m just the opposite of an early adopter. I like simplicity, and acquiring new technological trinkets without a clear value-add to my daily existence goes against everything I stand for. Well, that might be an overstatement, but you get my point. Even though I’ve had my iphone 4 for several months now, until recently, I had yet to really test out all of its allegedly wonderful features, namely Siri. I challenged her to some simple tasks of finding local restaurants for me to call and order take-out. She proved to be fairly capable. A few weeks back, I decided to give her the more complex challenge of providing me an update on my mother’s arriving flight. In a very surly tone, Siri replied, “I can’t help you with flights. Sorry.” And then she pulled up a “search the web” link for me to look it up myself as if I didn’t already think of that. I later picked up my mom at the airport after confirming that her flight was on time (no thanks to Siri). Then I picked up my dad after his flight came in and the 3 of us decided we could go for some Mexican lunch. We settled on Taco Mamacita, a great little fresh-Mex kind of place in Nashville. I had only driven there from my apartment, so I consulted Siri on directions from the airport to our lunch destination. I asked for directions to “Taco Ma-ma-seat-ah” from here. She responded with directions to “Taco Ma-mass-sit-uh” from my current location. While she was helpful in directing me to the restaurant, she could use some work on her pronunciation. I’m sure Siri will help me out of a pickle someday, but until then, I think I’ll have her stick to entry-level tasks. Link back to the blogger who nominated me. 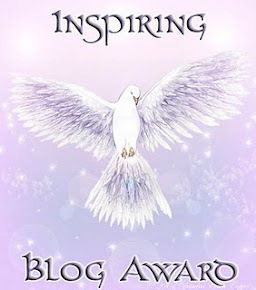 Post the blog award image on my page. Tell 7 facts about myself. 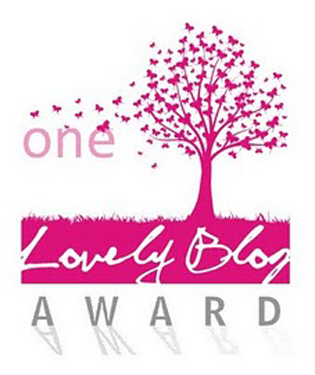 Nominate 15 other blogs and let the nominees know they been chosen. I realized at age 19 on an amusement park ride that I am somewhat claustrophobic. I don’t have a favorite color as I prefer different colors in different contexts. As a designer, I’d like to think I could make any color appealing with the right companions. Except mauve. I really don’t like mauve in any situation. I love wholesale clubs. Especially ones that carry 5lb bags of Ghirardelli 60% cocoa bittersweet chocolate chips. There was a period in my life when I shopped almost exclusively at Gap Boys. Thank goodness that phase is over. On a semi-regular basis, I have dreams (nightmares) that I am late for high-school lacrosse practice and don’t have athletic clothing, a lacrosse stick, a mouth guard, goggles or my locker combination. I don’t know what this means, but I’m sure it’s serious. Two of my favorite TEE-vee shows are Reba and Dexter, which could not be more opposite. I think that just about sums me up. A lot of the blogs I like have the same theme that I do. I wonder: Do I like these blogs because I like the theme? Or do I like these blogs because the writers like the same things that I do and therefore I feel a connection? Seriously, like half of the blogs I nominate have the “forever” theme. It’s so warm and nostalgic. So informal and yet tidy looking. It’s how I like things to be.